* Surviving the post-employment economy. * What if America had just two timezones? * The accreditors visit Hogwarts. * Common mistakes on the academic CV. * Executives Collect $2 Billion Running U.S. For-Profit Colleges. Disruptive! Innovation! Immanentize the eschaton! * Meanwhile, the federal government is poised to OK pension-looting. How can this be remotely legal? Pensions are delayed compensation. Can your employer give you a “haircut” on your monthly paycheck because they’ve decided they want the money after all? * ‘I’ll Be Your Mirror’: Lou Reed and the New York School of Poetry. * Also really good at self-assessment: Last Year President Obama Reportedly Told His Aides That He’s ‘Really Good At Killing People.’ Some instant nostalgia for the 2012 election, Romney-side and Obama-side. * What was supposed to be a secret letter authored by all sixteen of the current Democratic female senators urging Hillary Clinton to run for president in 2016 became public this week when Sen. Kay Hagan apparently accidentally mentioned it at an EMILY’s List event. * The demographics of the NBA. Really interesting stuff. * I just went and checked the last “lactation station” from the list. Most are locking bathrooms and/or public lounges, but this one is a locked asbestos-containing closet. * Hottest September On Record, Fastest Pacific Warming In 10,000 Years, Warmest Arctic In 120,000 Years. Probably nothing though. * And SMBC explores the curse of immortality. * It’s damn cold in Chicago: water is freezing to the sides of burning buildings. * The reality of being an adjunct. MOOCs for Credit. Why We Should Talk About the Football Coach’s Salary When Faculty are Let Go. Please consider not doing a PhD. According to this link (which has information I cannot independently verify), the athletic budget for 2011 was $16 million, a 9.2% increase over the previous year. $9 million of that budget came from student fees. The reduction in faculty is expected to save $5.2 million. * Lynda Barry’s course at the University of Wisconsin. I should be taking this. * Liberal pundits and Republican congressmen agree: Barack Obama’s second inaugural was the most liberal speech of his presidency. They may be right. But just what kind of liberalism is this? Obama’s speech was a far cry from the message of the modern Republican Party. But much of it would fit snugly in a handbook from Human Relations: Discrimination will not be tolerated. Active citizenship is everyone’s responsibility. Work harder. * Dr. King would be proud to see our Global Strike team – comprised of Airmen, civilians and contractors from every race, creed, background and religion – standing side-by-side ensuring the most powerful weapons in the US arsenal remain the credible bedrock of our national defense. Would he, though? Would he really? * Cheat to win: Virginia wants to rig the Electoral College too. It’s also worth noting, again, that this constitutes a massive disenfranchisement of African American and other nonwhite voters, who tend to cluster near urban areas. When you couple this with the move on Monday to redraw the state’s electoral maps — eliminating one state senate district and packing black voters into another, diluting their strength — it’s as if Virginia Republicans are responding to Obama’s repeat victory in the state by building an electoral facsimile of Jim Crow. * Brain scans performed on five former NFL players revealed images of the protein that causes football-related brain damage — the first time researchers have identified signs of the crippling disease in living players. The impending death of pro football. See also: Junior Seau’s Family Is Suing The NFL. * There’s a gold rush going on right now. Man is breaking the earth, looking for natural gas — just as we always have. 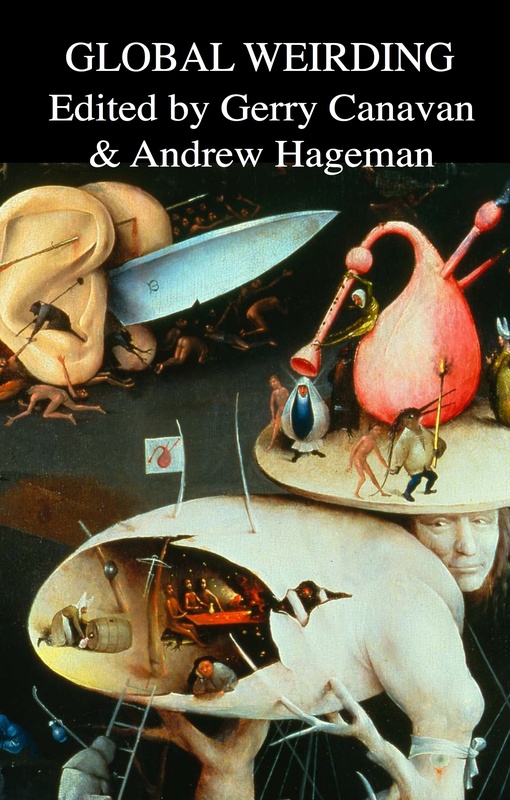 It’s a mad scene, with hucksters on every side of the issue. And that’s just on the surface. You won’t believe what’s happening underground. Thank You for Fracking. * U.S. scientists will retire most research chimps. * Searching for Star Wars artifacts in the California desert. * Rejected movie ideas: Age-Reversed Home Alone Reboot. * Internet argument perfect storm: The woman who hired a hitman to murder her abusive husband. * Happy Objectify A Man in Tech Day. * Supreme Court upholds radical notion that the Environmental Protection Agency has the right to protect the environment. * Loyalty oaths in Arizona high schools. * How it feels to be stalked. * War machine decides blood is blood: Pentagon Lifts Ban on Women in Combat. * The LA that never was. 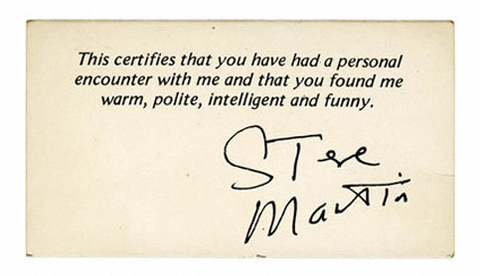 * And from the too-good-to-check file: The Fascinating Business Cards of 20 Famous People. “Night Witches” is the English translation of Nachthexen, a World War II German nickname (Russian Ночные ведьмы), for the female military aviators of the 588th Night Bomber Regiment, known later as the 46th “Taman” Guards Night Bomber Aviation Regiment, of the Soviet Air Forces. The regiment was formed by Colonel Marina Raskova and led by Major Yevdokia Bershanskaya. The regiment flew harassment bombing and precision bombing missions against the German military from 1942 to the end of the war. At its largest size, it had 40 two-person crews. It flew over 23,000 sorties and is said to have dropped 3,000 tons of bombs. 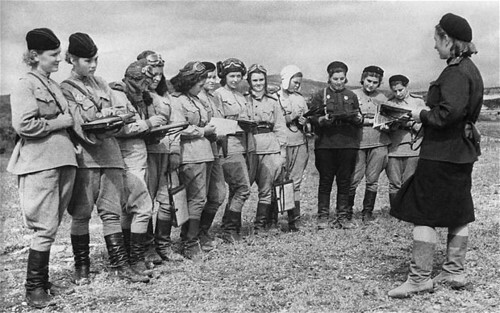 It was the most highly-decorated female unit in the Soviet Air Force, each pilot having flown over 1,000 missions by the end of the war and twenty-three having been awarded the Hero of the Soviet Union title. Thirty of its members died in combat. * Obligatory Twilight backlash: But when a saga popular with pre-adolescent girls peaks romantically on a night that leaves the heroine to wake up covered with bruises in the shape of her husband’s hands — and when that heroine then spends the morning explaining to her husband that she’s incredibly happy even though he injured her, and that it’s not his fault because she understands he couldn’t help it in light of the depth of his passion — that’s profoundly irresponsible. A countervailing view. Counter-countervailing. More. * Mental Floss’s library of obsolete sounds. * An interview with the creator of the Occupy Wall Street “bat-signal” projections during Brooklyn Bridge #N17 march. * North Carolina AFL-CIO: 9 Demands of the 99%. * Fear and Zugzwang in Zuccotti Park. * That’s the drawback of the modern lab mouse. It’s cheap, efficient, and highly standardized—all of which qualities have made it the favorite tool of large-scale biomedical research. But as Mattson points out, there’s a danger to taking so much of our knowledge straight from the animal assembly line. The inbred, factory-farmed rodents in use today—raised by the millions in germ-free barrier rooms, overfed and understimulated and in some cases pumped through with antibiotics—may be placing unseen constraints on what we know and learn. “This is important for scientists,” says Mattson, “but they don’t think about it at all.” Via MeFi. * GE Filed 57,000-Page Tax Return, Paid No Taxes on $14 Billion in Profits. * Weird science watch: Quantum theorem shakes foundations: the wavefunction is a real physical object after all, say researchers. Second experiment confirms faster-than-light particles. * Hermain Cain asks for Secret Service protection to protect him from… reporters. * And a big coup for Netflix: it will bring back Arrested Development. * xkcd has a funny observation about password strength, then gets into the weeds at AskMetaFilter to explain/defend the joke. * If Male Superheroes Posed Like Wonder Woman. The Gender Bent Justice League. * Moore’s Law may soon be broken. * What in life did it take you a surprisingly long time to realize you’ve been doing wrong all along? It’s not the first time I’m finding out about this, but I should say I don’t think I’ve ever written “discreet” correctly. * What drowning is like. * Why you’re getting divorced. * Climategate: absolutely no evidence of any impropriety whatsoever. * What to do about the suburbs? * Climate legislation vs. the filibuster. * And Salon has the latest on the Daily Show-Jezebel flare-up. * Stephen Hawking says we shouldn’t talk to the aliens. Yes, but what if they’re trying to talk to us? Both links via MeFi. * Hardline cleric vindicated; feminine immodesty now proven to cause earthquakes. * Jonathan Chait explains how not to play poker. * And they’ll tell you whether cell phones cause cancer… in thirty years.